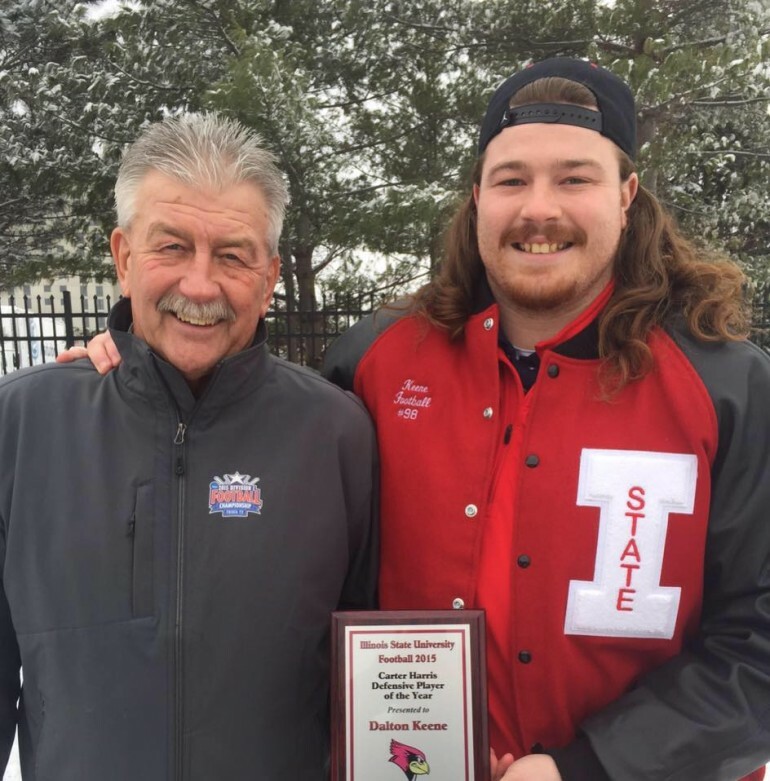 This past week at the Illinois State University football awards banquet, Jacksonville native Dalton Keene was named the Redbirds’ Co-Defensive Player of the Year, along with senior linebacker Pat Meehan, for the 2015-16 season. Starting all 13 games on the Redbirds’ defensive line this past season, Keene recorded 59 total tackles, 10 tackles-for-loss (-19 yards), 5 sacks (-11 yards), 3 pass break ups, 4 hurries, 1 fumble recovery, 1 blocked kick, and a safety. Over the past two seasons the Redbirds have a combined record of 23-5 with back-to-back Missouri Valley Conference titles and one FCS National Championship game appearance at the conclusion of the 2014-15 season, when Keene was a redshirt freshman. It was in that national championship game, against the four-time defending champions of North Dakota State, that Keene really showed his potential as a difference-maker on the Redbirds’ defense, registering 4 tackles, a sack, and 2 tackles-for-loss. Unfortunately, Illinois State eventually fell to NDSU in the title game, a contest ultimately decided by the final possession. And as Keene mentions, getting back to Waco, Texas – where the FCS Championship is played – is the team’s ultimate objective. When Keene initially arrived on the campus of Illinois State University in Normal, Ill., his first transition in terms of football would be moving from his high school position as wide receiver/defensive end to being a full-time defensive tackle. After seeing significant time during his redshirt freshman season, including four starts, Keene earned a permanent starting role as a sophomore this past fall. During his time at ISU, Keene has witnessed head coach Brock Spack transform Illinois State into a perennial FCS power, spending most of the past two seasons ranked among the top ten teams in Division 1-AA, as well as sending a number of players to the NFL.